Crepes are easy to make and have four basic ingredients: eggs, milk, flour and butter. The key to making a good crepe is a good pan and a little agility with one’s wrist. Once made, crepes are easy to store and can be prepared with an infinite variety of possibilities: filled or plain, folded, rolled or shaped into cups (with the aid of a muffin tin), or dessert, main entrée or breakfast fare. I was in Poland recently, and at a rest stop a person was selling fresh crepes rolled up, filled with jelly, and sautéed in butter. A basic recipe for crepe batter can be found in most comprehensive cookbooks, but the one I like the most is from a quirky little book called Crepe Cookery by Mable Hoffman . 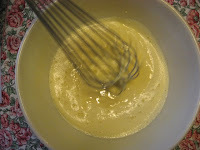 Her all purpose batter uses four eggs, ¼ teaspoon salt, 2 cups flour, 2 ¼ cups of milk and ¼ cup melted butter (page 12). You just combine eggs and salt, and then add flour in batches alternating with milk while beating with a mixer or whisk until smooth. At the end of the process add butter. Refrigerate batter for at least 1 hour before making crepes. I use this basic recipe to make my grandmother’s manicotti stuffed with a mixture of ricotta (part skim) (16 oz.) egg, ½ cup of grated Parmigiano-Reggiano, 1 cup of steamed or cooked frozen spinach chopped and squeezed of excessive moisture, salt, pepper and a pinch of nutmeg or mace. Spread a light coating of marina sauce in a 2 quart Pyrex style casserole dish. [I am not embarrassed to admit that I prefer a Vermont brand ― Dell’Amore]. Cover with foil and bake at 375۫ for 50 minutes; take off foil for last 10 minutes. 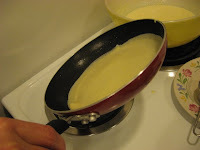 For the desert recipe shown above, I use the “Basic Desert Batter” from Crepe Cookery, using the same amount of eggs, 1 cup of flour, 2 Tablespoons of sugar (I use only 1), 1 cup of milk, ¼ cup of water, and 1 Tablespoon of melted butter (page 17). This recipe claims to make 20-24 crepes, but with my size of crepe pan it is more like 10-12. As for the crepe production, have on hand 10 inch (or so) squares of wax paper to match the number of crepes you plan to make. When you’ve made one crepe, place it on wax paper and cover with another piece, continuing until you’ve finished all of the batter. I use an 8 inch good quality non-stick sauté pan coated with a small amount of canola oil rubbed around the pan using wax paper. Before heating up the pan on medium heat have the batter ready. It actually isn’t a bad idea to use 2 pans at one time, the process will go much faster, however timing is everything when making crepes, so I choose the slow route using only one pan. Make sure the pan is heated up for at least 5 minutes or more. I use a 1/3 measuring cup to scoop batter into the center of the hot pan. Immediately lift the pan off of the burner and begin to roll the batter as if you had a marble inside the pan that you wanted to keep in a circular motion. Eventually the batter spreads out from the center and up the sides (slightly) of the pan looking like soft pasta dough. Place it back down on the burner for just 10 more seconds and using a very thin heat-resistant spatula take the crepe and flip it over. Heat for about 15 seconds [or until a slight browning of bottom-side surface area] , then turn crepe out onto one of the sheets of wax paper and cover with another. Continue making the remaining crepes. You can store in the refrigerator or freeze in a sealed proof freezer bag. As for the filling in this featured desert, I used a modified cannoli recipe: 1 ½ cups of ricotta cheese (drained, i.e. 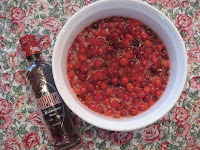 let sit in a colander in fridge for about 2 hours), 3-4 Tablespoons confectionary sugar, 3 Tablespoons of Polish cherry vodka (Wisniowa). Take one crepe and spread 1-2 Tablespoons on the bottom of the crepe and then rollover twice. 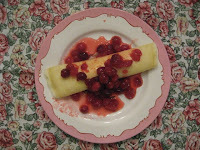 I spooned over the crepe fresh cooked cranberries (because it is in season). Just a note: The Polish cherry vodka is 35-proof. I loved all the details and excellent descriptive photos. I had no idea that dessert crepes and manicotti shells were so similar. I always think of manicotti as pasta.